The chemistry academics of IPB once again made a proud achievement in “Pemilihan Dosen dan Tenaga Kependidikan Berprestasi Tingkat IPB”. Prestasi diraih oleh Rohmat Ismail, AMd swon the second place in the 2018 Achievement Education Laboratory category; Asep Suryana, AMd was ranked fifth in the 2018 Outstanding Financial Managers category; and Dr. Irmanida Batubara, MSi as an Achieving Lecturer at the FMIPA level in 2017. The Department of Chemistry congratulates and rewards the achievements that have been achieved. 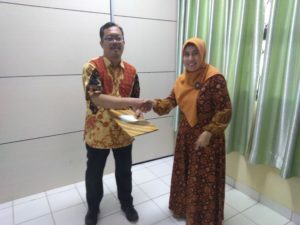 With the achievement, the achievement is expected to be able to encourage the creation of a quality and competitive education and research atmosphere, as well as increasingly professional academic services in the Chemistry Department of IPB. 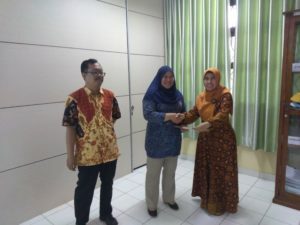 Hopefully the achievements of the Chemistry Society of IPB can continue to be improved so that the Chemistry Department will become more prosperous.